What comes to mind when you think about marketing? Or better yet, what comes to mind for others when they think about marketing? Can you remember the last time you told a non-marketer you were in marketing? Maybe I am making it up in my head, but often, when I share with others that I am a marketer, I sense this almost apologetic cringe from them. At best, it seems that they are experiencing some sympathetic sorrow that I would be stuck in such a profession. At worse, they project some sort of evil motive in the remainder of our often shortened conversation. I have frequently danced around the term, even outright denying it at times. However, the truth is marketing is one of the most honorable careers that one can undertake. I believe this wholeheartedly, and I am writing this post to once and for all declare my passion for this often reviled role. I confess, it took me some time to see the honor of marketing, but the tipping point for me was a diagram by Michael Porter. It revealed the ultimate reason that marketing exists: perception. 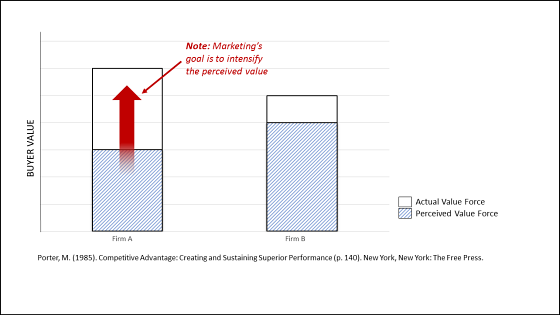 Contrary to popular belief, the true objective of marketing is not to trick someone into buying or doing something that they do not want, but rather to bridge the gap between the reality of actual value and its perception (as shown below). This gap between perception and reality is one of the most common problems an organization/institution faces. There are so many amazing organizations out there that have real, tangible and even essential value to offer prospects, but for one reason or another, they struggle to get their customers to perceive this value. For instance, just this week, I was working with the executives of an organization that has one of the highest quality and most reliable digital meeting/webinar products in the industry. However, because of the competitive noise in the marketplace, and even confusion in their own marketing collateral, the real value this company offers is virtually indiscernible. In fact, prior to this week, I personally had never really heard of this organization. For me, it is in these conversations that the true value of marketing emerges. You will notice in Porter’s diagram above that Firm B, though having less actual value than Firm A for the prospect, is likely convincing more people to convert. You will also notice how Firm B has greater actual value to offer these customers, yet because of the lack of perceived value, potential customers are missing a genuinely greater opportunity. How many of us have missed great opportunities because of ineffective marketing? Or conversely, have you ever experience the joy of discovering the right option for a particular problem you had? If so, you can thank marketing, informal as it may have been. In the end, this is the real beauty of marketing: connecting real value to real people. Again, using the example above, I am the perfect prospect for this meeting/webinar solution. As a team leader, I have digital meetings several times a day. As an educator, I host webinars several times a month. And yet, unknowingly, I was completely missing the potential value that this organization could offer me because it was hidden by ineffective marketing. When I sat down with the marketer of this product, and she walked me through all the genuine benefits of the solution, I immediately realized its potential. In that one conversation, that marketer had bridged the gap between real value and my perception of it, resulting in me discovering something that I would have never known on my own. This is the honor of marketing. At the end of the day, marketing exists because perception does not. We do not craft deceptions of reality; we enable perceptions of reality. We help businesses that have something to offer the world effectively share it. We help prospects looking for a solution to a problem effectively find it. We connect real people to real value. I admit, the irony is that marketing will likely always have a “marketing problem.” Trying to solve it in your next personal introduction is not probably worth the effort. But what I hope you remember is, though the rest of the world might not see it, marketing done right serves an honorable and much needed role in all of our lives. So marketer, hold your head high. Without you, we would all be missing so much. Austin McCraw, Senior Director, Editorial Content, MECLABS Institute. From Web clinics to certification courses, Austin works behind the scenes to bring our research analysts’ discoveries to our audience in clear and creative ways. Before joining MarketingExperiments, Austin was the Promotions Director for a PBS affiliate in Gainesville where he was in charge of publicizing local and national programming. A graduate of the University of Florida’s College of Journalism and Communications, Austin specializes in new media and video production by day and producing family memories with his wife and two children by night.